The Supreme Court has rejected the effort to eliminate the “Don’t Ask, Don’t Tell” policy in the military which, if you don’t understand the policy, should mean that the subject of sexual orientation is completely off limits. It doesn’t, however, work that way. His shipmates gather around to hear the story of his exploits on shore leave, and he begins to tell them about this beautiful Thai girl he met and all about their night bar hopping and then, in exquisite detail, about their night at a local hotel. “Ahhh, yes sir.” The confused sailor says meekly. “Ahhh, yes sir, I am…but I thought that was just for the queers.” Winters answers in a pleading voice. My opinion is that “Don’t Ask, Don’t Tell” seems like a good idea for one reason only: it’s terribly discriminatory, yes, but it helps provide for the safety of gay service people. The world is filled with people who are in one degree or another homophobic, and in the close quarters of the military where a lot can happen very suddenly, they are a potential life-threatening danger to gays. The U.S. military spends about $30 million a year hunting down and expelling homosexuals from its ranks, in a clear and open defiance of the “don’t ask, don’t tell, don’t pursue” law, even though its own studies, from the 1950’s to the present, have shown time and time again that they do not represent the threat to “unit cohesion” that is the reason usually given for expelling them. In spite of the military’s insistence that unit cohesion is a problem, the fact remains that during times of war, expelling homosexuals from the ranks goes way down (and was practically halted during the Gulf War), when unit cohesion is actually of greatest importance. If unit cohesion were really the motivator, why do they quit expelling that ‘threat’ when the need for cohesion is greatest? No one at the Pentagon has ever answered that question. The answer is obvious to any thinking person: it’s institutionalized homophobia. And this is a case where homophobia directly costs the taxpayers $30 million each and every year it is allowed to govern military policy. And that doesn’t count the cost in thousands of destroyed lives caused by the illegally issued general discharges that sully the reputations of these honorable men and women. While Obama stays cautious, the Pentagon has discharged nearly 240 people under the policy since he took office, according to the Service Members Legal Defense Fund. 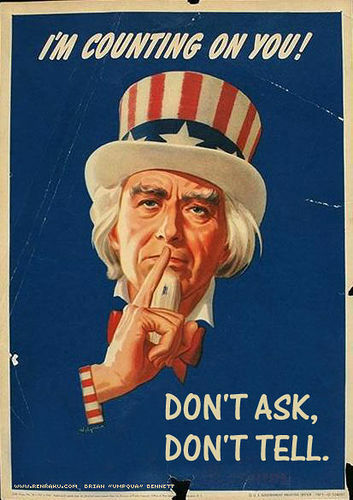 Last year, the Pentagon discharged 619 people because of “don’t ask, don’t tell”. The year before, the number was around 600, too. And the defense fund’s Web site contends that nearly 13,000 service members have been discharged since 1993 under the policy. My long-time theory is that the people who will act most violently against gays do that because they are afraid that they themselves are latent homosexuals. Mr Bidstrip also wrote about that in his essay but to me it seems to be a prime theory — after all, why else would anyone care enough to commit a violent act? The Supreme Court doesn’t have to say why it decides not to hear an appeal. In this instance, maybe they didn’t like the confused nature of the case, maybe they want to wait until the future make-up of the court is more clear, maybe they’re too busy, etc. An lot of the discussion on what does and does not affect good order, discipline, and morale in the military comes from people who have no idea what they’re talking about because they’ve never been there. They have no first-hand experience living in the close quarters of a ship’s crew compartments, in a barracks with open latrines and shower stalls, or in a foxhole. It really isn’t an issue of homophobia, for the most part, and there’s no significant issue of violence against gays in the military. Characterizing it that way doesn’t do justice to the facts or the complexity of the issue. As I’ve said before, I think fighting this issue is not worth the headaches. Gays serving openly in the military can work, and I think the “don’t ask, don’t tell” policy, with all its irrationality, should be changed. But that doesn’t mean there aren’t real issues and problems. It just means I think they can be dealt with. As I have stated before, Gay rights are not all that’s happening in our country. There are issues of equal or more importance that require our attention. Yet here we are talking about it while the economy flounders and our tax burden is fast approaching it’s flash point. I used the term “rejected” because by deciding not to hear the case they did indeed reject the attempt to eliminate DADT. You mention that the Obama administration supports the DADT policy now, but you didn’t mention that their support represents another link in Obama’s growing chain of false promises during his campaign. Perhaps wherever you served it was different but on my ships there were many violently homophobic rednecks and the two or three gay sailors I knew learned that you either became a world-class lier or became the victim of some nasty pranks. At that time gays were not allowed to serve at all and those who were discovered to be gay were not reported to the ‘brass’ because then they wouldn’t be around to harass. It’s people like those rednecks that made me decide not to re-up after my first four year hitch — I hate being around ignorant people — much less living with them. You’re right that fighting the issue is not worth the headaches — at least not worth it to us! Yes there are many other issues that are worth talking about and the economy is a prime example but, at least from my prospective, the economy is a lost cause. We have at least 3 1/2 more years of Obama and, unless (as Tom says) he learns some very vital economic lessons very, very fast, our economy will no longer be in the toilet — it will be flushed. I’ve written to my Congressmen but that is a very unrewarding effort and I’ve blogged about taxes and the economy just a bit — and I will continue to — but I have the sinking feeling that there is just nothing effective that we, the average citizens, can do about it. I generally leave my complaining to the “new leader” of the Republican Party: Rush Limbaugh and to another brilliant radio host, Neal Bortz. Well, Harvey, I spent 30 years in the Army, from teenaged private to colonel. I also had significant contacts with the other services at all levels. I didn’t encounter any “violent homophobic rednecks.” But then maybe my experience was too limited. There are a lot of men in the military who don’t like gays — probably more than in the general population. All things considered, it would be surprising if that weren’t true. But few, in my experience, are “homophobic,” using the correct definition of that term. Also, few are violent, in the sense that they might severely injure or kill another soldier because he’s gay. Fights now and then, yes — but soldiers fight over lots of things. Again, all things considered, no surprise. One fact often not considered, mainly because the people talking don’t know enough to discuss it, is the real nature of military society/culture. It’s disciplined and controlled, in a very positive sense. Standards are clear and enforced. I spent 25 percent of my career in formal command positions, and I commanded thousands of soldiers. I didn’t tolerate violent behavior, and I don’t know any officer who did. I also know how policy is taught to soldiers and supported. If it’s ever decided to accept openly gay people in the military, the system will accept it and deal with it positively, at every level, despite personal feelings. Anyone who can’t support it will be free to leave the service, but that will be rare. Even Israel, the alleged mother of homophobia as per interpretation of self-styled “Christians,” allows gays and lesbians in its military forces and they continue to be the best and undefeated in the Middle East. Of 23 nations that allow gays and lesbians in their military NONE have suffered for loss due to lack of military readiness or homophobic problems in the ranks. We wonder what are the special peculiarities of U.S. military forces that have for so long exhibited a homophobic mind set predicated on alleged negative military readiness and problems related to homophobic personnel? BTW, it’s not much for God, Country, Mom & apple pie that most join the military. They are trying to escape unemployment, poverty, boredom, debts, jail or even a pregnant girlfriend. Give me a break, Pilgrim. Recaredo, I’m OK with everything you said up to the last paragraph. Do you have any data to support that claim? What you say is undoubtedly true in some cases, but your use of the term most and your implication that the majority serve for negative rather than positive reasons doesn’t hold true in my experience. But, that’s just my experience. Again, any data? Often, we can answer our own questions by simply using an internet search enginge. Using the keywords “study reasons for joining the military not patriotism,” I found the following link and its informative content. Enjoy. “…The conservative claim that most youth enlist due to patriotism and the desire to “serve one’s country” is misleading. The Pentagon’s own surveys show that something vague and abstract called “duty to country” motivates only a portion of enlistees. The vast majority of young people wind up in the military for different reasons, ranging from economic pressure to the desire to escape a dead-end situation at home to the promise of citizenship. Over all, disenfranchisement may be one of the most accurate words for why some youth enlist. I’m not particularly impressed by a leftist, anti-war, anti-military source. The fact is, the decision to join the military, like almost every other decision in life, is complex and includes many factors. It’s also likely that patriotism and self-interest are both present in most decisions to enlist, and there’s nothing wrong with that. If someone volunteers for military service because of economic incentives plus a patriotic desire to serve, where’s the problem? The left consistently tries to paint the military, especially the Army and the Marine Corps, as being full of economic losers, misfits, and poor folks who joined out of desperation, only to have their lives wasted by an evil country. That’s utter nonsense. I served about 10 years in the draft-era Army and about 20 years in the all-volunteer Army, and the fact is that reality you think exists comes purely from your imagination. I don’t want to get in a link war with you, but you might want to look at this DOD document. Must be a reading comprehension problem. Read it again. Saying that “duty to country” only motivates a portion of enlistees is not the same thing as saying that the armed forces are coercing youths into service. All you’re saying is that there are other factors involved and that a simple patriotic desire to serve is not always one of them. You also offer no proof that the subsequent things you say are also from Pentagon sources, nor does the article you link to actually connect to any actual sources from either the Pentagon or other institutions. However you feel about the fact that some people join the military for the chance to lift themselves out of poverty, the fact remains that the people who take this route are not ignorant of the risks, they usually have other options available to them (as do most people with the determination and the desire to work their way out of poverty) and they choose the military anyway. As for myself, I know a fair number of people who joined the military at least partially out of a desire to serve their country, both as enlisted and as ROTC. One graduated and works at Kirtland AFB. Another two are a married pair of graduated ROTC stationed in Florida. Yet another served as an enlisted navigator in the Marines for four years before going to college on the military dime; he is reenlisting as an officer. A fifth liked the Army so much that he actually spent 2 more years there after his original 4 year term, he holds a bachelors in aerospace engineering and is now working on his MBA (again, nearly all on the military dime). Still another recently enlisted in the Air Force voluntarily; he’s not a close friend so I don’t know him that well, but as far as I am aware economics and coercion played no factor in his decision. Still another went through the Air Force Academy; she came from an affluent home and was under no pressure to join the military. I myself considered Air Force ROTC for college despite the fact that I was under no economic pressure to do so, and would still join the military quite willingly if I thought my country ever truly needed me and if I didn’t know I’d do the military more good in a lab than I ever could on the battlefield. And in any case, even if what you were asserting about the military were true (which you offer no proof that it is) the only real alternative to recruitment would be going back to the draft, which is an infinitely more immoral system than any track of voluntary recruitment ever could be.